Minitab is a provider of quality improvement and statistics education software. Its flagship product, Minitab Statistical Software, is used by different companies to graph and analyze their business data. The program has also revolutionized the way numerous colleges and universities learn statistics. The primary Statistical Software works best when paired with other solutions in Minitab’s suite of products: Minitab Companion has a wide range of tools to help businesses attain process and product excellence, while Minitab Quality Trainer helps users master statistics. When the applications are utilized together, users are able to better identify processes and product aspects that they need to improve on. The technology’s flagship product, Minitab Statistical Software, has comprehensive yet easy-to-use tools to help companies run smarter and more thorough data analysis. Even without advanced expertise in statistics, those who use the software can draw substantial data easily. Its ease of use helps not just businesses, but also colleges and universities when it comes to teaching statistics and data analysis. The application has an Assistant feature that walks users through data analysis to help them interpret results more accurately. When a business is able to determine areas of improvement precisely, they are likely to come up with more effective measures to boost efficiency and upgrade product or process quality. Minitab has state-of-the-art features that help streamline workflows and meet users’ quality improvement goals. Project Roadmaps makes it easy to rollout, share, and replicate projects throughout a company. Instant Insights are also automatically displayed on the program’s dashboard so that users can monitor statistics in real time. The flagship software’s supplementary application, Minitab Quality Trainer, aids users in further analyzing derived statistics. It serves as a cost-effective way to study statistics anytime users are online. 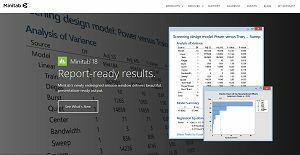 Aside from this, Companion by Minitab provides tools so that users can present data with confidence. Aside from the main functions, Minitab is recognized in the statistics industry for providing superior customer service. User reviews attest to its exceptional training and reliable customer support. Companies are also able to maximize usage because of the software’s multi-user licensing. If you are considering Minitab it could also be a good idea to analyze other subcategories of Best Data Analytics Software gathered in our base of B2B software reviews. Companies have diverse wants and requirements and no software solution can be perfect in such a condition. It is pointless to try to find an ideal off-the-shelf software system that meets all your business wants. The wise thing to do would be to modify the system for your special needs, employee skill levels, finances, and other factors. For these reasons, do not hurry and invest in well-publicized leading systems. Though these may be widely used, they may not be the ideal fit for your unique wants. Do your research, investigate each short-listed system in detail, read a few Minitab reviews, contact the seller for explanations, and finally select the application that presents what you want. How Much Does Minitab Cost? We realize that when you make a decision to buy Data Analytics Software it’s important not only to see how experts evaluate it in their reviews, but also to find out if the real people and companies that buy it are actually satisfied with the product. That’s why we’ve created our behavior-based Customer Satisfaction Algorithm™ that gathers customer reviews, comments and Minitab reviews across a wide range of social media sites. The data is then presented in an easy to digest form showing how many people had positive and negative experience with Minitab. With that information at hand you should be equipped to make an informed buying decision that you won’t regret. What are Minitab pricing details? What integrations are available for Minitab?